The EPA’s proposed ozone standards (moving from 75 parts per billion into the 65 to 70 ppb range) would place at least 15 Colorado counties in “non-attainment.” These are some of Colorado’s most populated counties, responsible for 89 percent of the state’s economy and 85 percent of state employment. Denver, Colo.: A plan from the U.S. Environmental Protection Agency (EPA) to dramatically tighten federal ozone limits will impose new and damaging regulatory restrictions across nearly 90 percent of Colorado’s economy, and also threatens to make traffic congestion even worse in the Denver metropolitan area, according to a new economic study commissioned by the Center for Regulatory Solutions (CRS), a project of the Small Business Entrepreneurship Council (SBE Council). 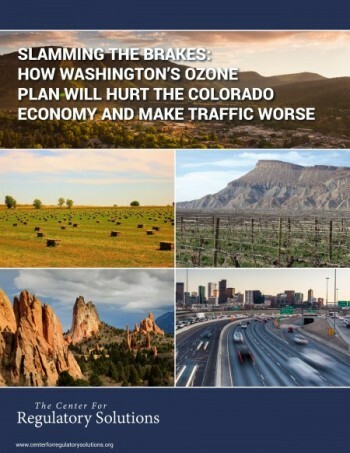 The report, “Slamming the Brakes: How Washington’s Ozone Plan Will Hurt the Colorado Economy and Make Traffic Worse” also highlights strong and broad-based opposition to overreaching federal policies that ignore the state’s proud history of environmental stewardship. Through interviews, letters to the Obama Administration and other channels, a bipartisan coalition of state lawmakers, local officials and leaders of the business community are sending an unmistakable message to Washington: This ozone plan goes too far. Newly released polling shows that Colorado voters are also wary of unwarranted federal environmental controls over the state’s economy and job creators. A statewide public opinion poll, commissioned by the Colorado Association of Commerce & Industry and the National Association of Manufacturers, found 76 percent of Colorado voters rate their local air quality as “Excellent” or “Good.” Strong majorities believe stricter federal air quality regulations will make it harder for local businesses to start or expand (62 percent), increase the price of everyday goods and services (76 percent) and increase the amount they pay in taxes (77 percent). Most Coloradans surveyed (77 percent) said state and local officials should have more say over air quality regulations in their area than the federal government. By a nearly two-to-one margin, Coloradans believe the bigger problem for their local area is “less economic growth and job opportunities caused by regulations” (57 percent) rather than “lower air quality caused by pollution” (30 percent). Furthermore, wide majorities (i.e. more than 55 percent) are unwilling to tolerate more traffic delays and longer commute times, or accept less economic growth and job opportunities, because of stricter federal air quality regulations. These concerns in Colorado reflect widespread opposition across the country to the EPA’s plan to tighten the current ozone standard of 75 parts per billion (ppb) into the range of 65 to 70 ppb. As detailed in today’s CRS report, local and national groups representing cities, counties, transportation departments, agricultural agencies, state-level environmental regulators, labor unions, construction companies, energy producers, manufacturers and many other stakeholders have all sounded the alarm. These diverse stakeholders are pleading with the EPA to stick with existing 75 ppb standard, which was set less than a decade ago and has yet to be fully implemented. Ironically, the Obama administration already rejected EPA’s plan to dramatically tighten the federal ozone standard in 2011 due to overwhelming state and local opposition. But at the urging of the environmental lobby, the Obama EPA is trying again. The Center for Regulatory Solutions is a project of the Small Business & Entrepreneurship Council (SBE Council), a nonprofit, nonpartisan advocacy, research and education organization that works to protect small business and promote entrepreneurship. For 22 years, SBE Council has influenced policy and private-sector initiatives that have strengthened the ecosystem for startups and small business growth. For more information, please visit www.sbecouncil.org.